Nintendo is set to offer a new online photo services in partnership with Fujifilm, to enable Wii users to print off the photos that they upload to their console with ease. While there are hundreds of photo-printing services available online, this is a first for a gaming console, and will enable Wii users to upload snaps to the Wii Photo Channel and print photos via their console. As well as printing off the photo albums of your holiday snapshots, you will even be able to order Nintendo-themed business cards and photo books that display your favourite Mario Kart character or your Mii (as pictured here), which sounds particularly cool to us. TechRadar has spoken to Nintendo UK and Fujifilm UK today and we should have more news on when the service will be rolled out in the UK and Europe very soon. "Nintendo will start providing new Wii Channel called "Digital Camera Print Channel (English name still tentative)" at 2pm on 23rd JPN time. It is a collaborative service with FUJIFILM Corporation. Customers will send the photos and order information from this channel, the information will be sent directly to FUJIFILM, FUJIFILM will handle the rest of the service(production and delivery). 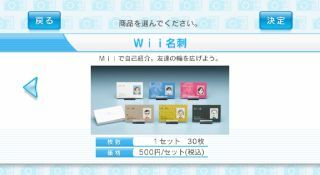 The payment system will be also operated by FUJIFILM, Wii Point system is not available, only credit card is acceptable. FUJIFILM plans to exhibit this channel at Photokina, which will be held in Germany this September."